Dorianna Medeiros, the new president of NAGE Local 458, testified on behalf of House Bill 2394 in front of the Joint Committee on Public Service at an October 27 hearing. House Bill 2394 seeks to clarify and strengthen the assault pay statute for court officers injured as a result of acts of violence in the courtroom or public areas. Currently, a court officer injured on the job as a result of an act of violence may not receive assault pay, depending on the circumstances or of the injury sustained. Bill 2394 would expand the circumstances under which a court officer could receive assault pay to more accurately reflect the risks taken by court security officers while on duty. NAGE will be working on keeping you up to date on this issue. Please check NAGE.org/trialcourt for updates. Also please click the link below for the letter from Director of Security, Jeffery Morrow. 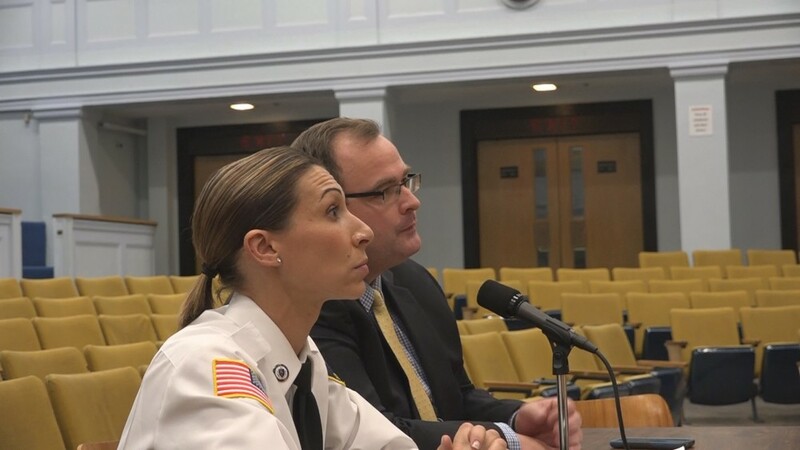 Dorianna Medeiros (left), president of NAGE Local 458, testifies at a legislative committee hearing with Jim Redmond from the NAGE legislative department on a proposed revision to the assault pay statute for court officers.